Ease sore muscles with our muscle relief blend! Muscle Relief Essential Oil Blend diluted in Massage Base (ready to apply). This blend has been designed to help ease muscle soreness and tension and is especially nice after a strenuous workout! 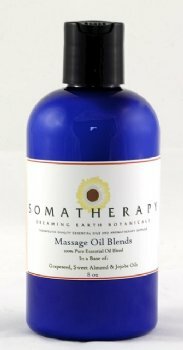 Premixed in our Massage Base oil, so can be applied directly to sore muscles or added (one cap full) to a warm bath. A blend of 100% pure Essential Oils: Roman Chamomile, Cajeput, Ginger, Juniper, Lavender Provence, Marjoram, and Rosemary in our Massage Base oil (a combination of Sweet Almond, Grapeseed and Jojoba oils).